Training Industry has named d'Vinci Interactive to the Content Development Watch List. The list is part of Training Industry's mission to continually monitor the training marketplace for the best providers of training services and technologies. In 2017, d'Vinci grew substantially through its merger with JPL's learning solutions group. The combined company develops learning experiences, educational websites and web and mobile applications for corporate, government, medical and K-12 educational content clients. 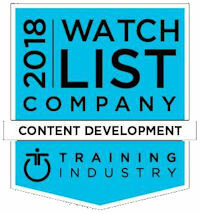 "The organizations selected for this year's Content Development Watch List are emerging providers who demonstrate capabilities to provide quality custom programs for companies in a wide array of industries," said Danielle Draewell, market research analyst at Training Industry, Inc. "These companies should be considered for any opportunity that demands innovation to provide engaging courses." "We're excited to earn this recognition for our work and our team," said d'Vinci CEO Luke Kempski. "It endorses the creative solutions we're providing to boost learner performance and help our clients become innovative leaders." For more than 20 years, d'Vinci has provided custom learning solutions to government agencies, corporations, medical education and certification organizations and educational content providers. d'Vinci collaborates with clients to bring order and clarity to content and technology. d'Vinci extends its capabilities through its parent company, JPL (JPLcreative.com), a creative agency that provides strategic marketing, internal communications, media production, and web development to regional, national and global brands.